With Spring just around the corner, this stunning modern new build in Dartmouth certainly sprung into life last week. To welcome you in, we supplied the bespoke made well-appointed solid oak front door, with a singular glass strip running through the centre and side lights encompassing either side. To accompany this, a full length stainless steel handle and ironmongery contrast against the oak, creating the modern feel as soon as you open the front door. This property is all about letting the light in to create a sense of openness and space. By implementing side lights and the glass strip, this allows light to flood through into the hallway, giving you the feeling of openness from the moment you walk in. A focal point inside the property, and one of the first sights you will see as soon as you walk through the front door, the oak and glass accompaniment continues with the elegant main staircase. 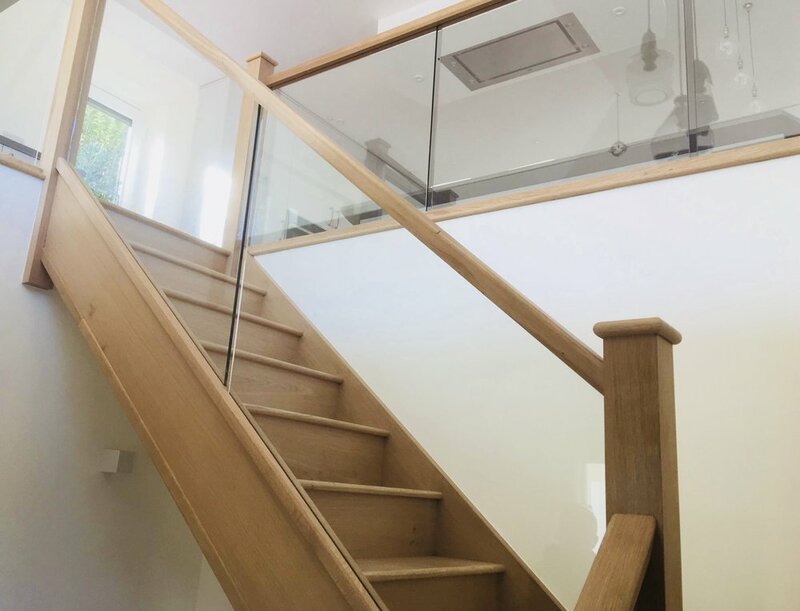 No longer just a link between two floors, staircases provide a fantastic architectural feature from the moment you step inside a property, turning an ordinary entrance into an elegant one. The feeling of space continues to be felt throughout the home. Light that has already flooded in now passes through the glass balustrading of the staircase, illuminating the white walls creating a clean, bright and uplifting space. Climbing up the staircase, you enter into the upstairs of the property into a spacious, open planned, kitchen diner. Continuing to bring light into the home, we supplied floor to ceiling PVCu two tone windows. PVCu windows are manufactured to the highest quality and they will not rot, rust, peel or flake. All they need is an occasional wipe down with soapy water to keep them looking their best. Each one is made to measure to ensure a perfect fit. Leading out onto one of the three balconies, a matching PVCu bi-fold door provides seamless entry in the summer and warmer months between outside and in. Walking to the other side of the open plan top floor, this leads you to another one of the balconies. In keeping with the rest of the property, light once again fills this space with a large PVCu window and French doors leading out to another balcony. Once out on the balconies, newly installed glass balustrading gives unhindered views of the surrounding area. Heading back down the main staircase to the ground floor of the property, roof lights continue to let light into the home. These provide a great solution when windows are not a viable option. 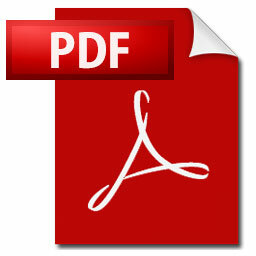 All products highlighted in this article have been supplied and fitted by ourselves. We hope you enjoyed our blog post and look forward to sharing future projects with you. Durable, stable and sustainable, where cutting edge technology meets nature, Accoya wood is the up and coming material to use when a timber look or finish is required. First commercially used in 2007, it has ever since been on the increase, being used in more projects around the globe as the notion of what can achieved with Accoya becomes more apparent. Through a process known as acetylation, which has been studied for over 90 years, the sustainable wood is soaked in acetic anhydride and the cell structure within the wood is changed. Hydrogen, oxygen and carbon chemicals are created during the acetylation process within the wood, therefore, changing the cell structure which before contained free hydrogen and oxygen bonds. All of these chemicals are found naturally in wood making this process 'green' due to no other chemicals being added. The leftover acetic anhydride is then removed and each batch of Accoya wood is quality tested to ensure all Accoya lives up to it's impressive characterisitcs. What Are the Properties of Accoya? Accoya is extremely versatile due to it's outstanding properties both above ground, below ground and even in water! Whilst also being able to withstand the toughest conditions, Accoya wood is the go to for anyone looking for durability with great looks. Although it can be used for a variety of projects, Accoya is a fantastic option for both windows and doors. Not only for it's durability, it is also naturally insulating, requires very low maintenance and is dimensionally stable. This means that your doors and windows will no longer swell and will instead open freely all year round. For more information on Accoya, please take a look at the brochures below or alternatively get in contact with us here for more information. 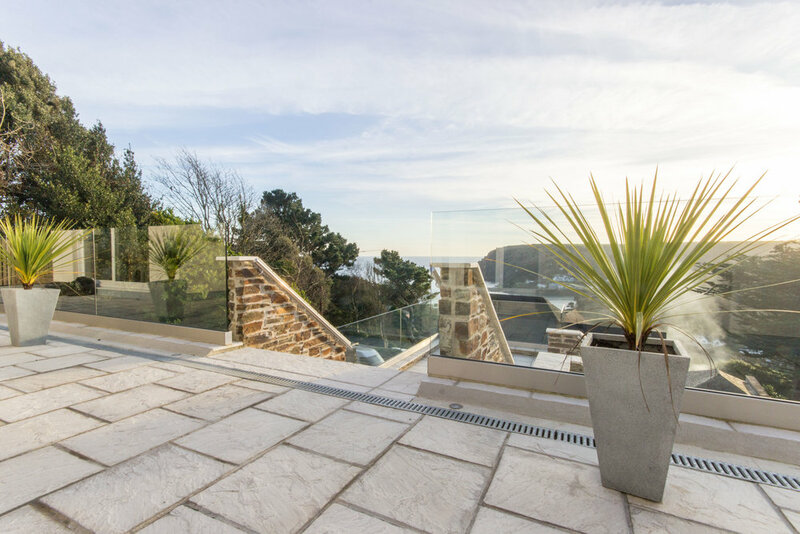 A project we completed in Salcombe last month. 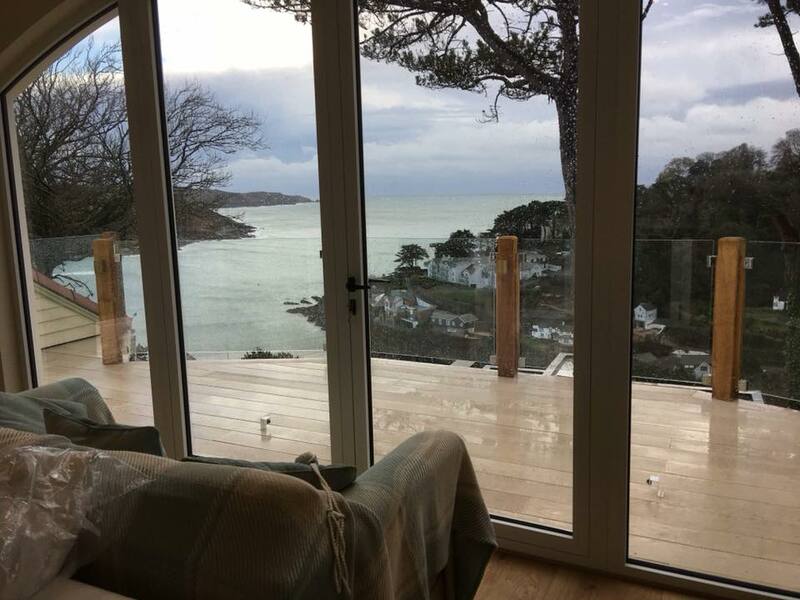 Glass balustrading is a popular choice and with views like this you can see why. Unhindered scenery of Salcombe estuary and the surrounding area. New posts and glass balustrading were added to the top decking and replacement glass to the bottom section. Happy New Year! As 2017 draws to a close and an exciting year ahead beckons, we decided to take a look back at some of our favourite projects completed in 2017. 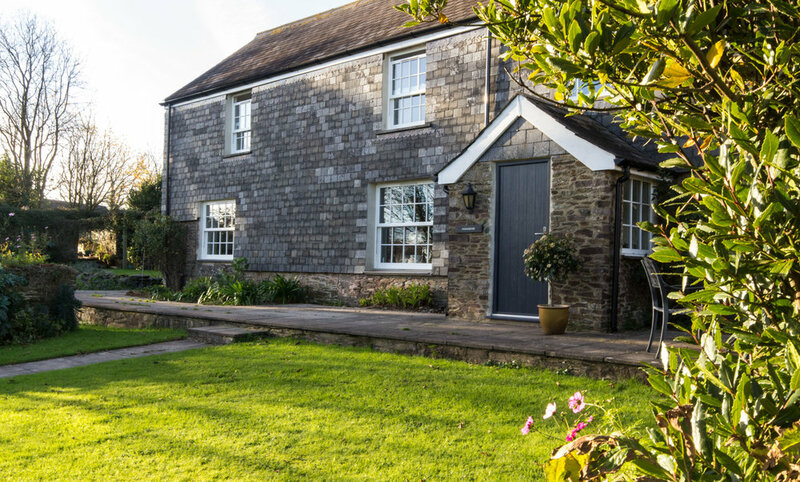 Situated in Halwell, Devon, Higher Poulston consists of a complex of renovated barns and new builds. The farmhouse in particular was an exciting challenge, as we had to maintain the character of the building. Therefore, we replaced the old tired softwood windows with woodgrain, White Ash, PVCu sliding sash windows. PVCu is a popular choice due to its properties of being maintenance free and durable. If you are looking for a traditional style, White Ash is often used as it resembles a natural painted finish compared to the usual Brilliant White PVCu. To finish the sliding sash windows, astragal glazing bars were used to give a thin glazing bar effect. Salcombe is the jewel of the South Hams with spectacular scenery. Perched on the hillside, this property couldn't be in a better location with stunning sea views and the mouth of the estuary. In this instance, frameless glass balustrade to the terraces and balconies was the only option. This created a seamless transition between the patio area and the surrounding views. Our clients wanted a contemporary style property but with a heritage twist, blending with the buildings in the surrounding area. This new build bungalow in Strete, Dartmouth, has achieved this look by using Heritage Chartwell Green, woodgrain, PVCu. A light and airy feel to the home was accomplished by a wall of full height glass screens and sliding patio doors. We hope to have given you a little insight and inspiration and look forward to seeing you in 2018. Over the last few months we have been working hard on our website to create a new, visually pleasing, yet user friendly site for you to enjoy. Here at Woodplas, we pride ourselves on the quality of our products and also our service, so therefore, it made sense to have a quality website too! One element we were really excited about was creating a blog section. This we wanted to use as a tool to keep you up-to-date within the world of Woodplas, whilst also providing helpful advice and tips in one convenient place! Make sure to keep checking back to see what's going on.